Over the years, our team has amassed an impressive record of racing victories that includes numerous state championships, and national championship podium finishes. Winning races is fun, but that’s not the reason why we place a heavy emphasis on competition. Our primary focus is on the positive experiences that bike racing can provide, win or lose, and on the development of strong character and sportsmanship in all of our riders. Racing provides an opportunity for kids to push themselves to achieve results they never imagined possible, and the confidence they gain through the sport carries over to every other aspect of their lives. Mountain bike racing is different from other youth sports in a number of very important ways. Most kids who play traditional team sports never play again once they graduate from high school. Cycling can provide a lifetime of active enjoyment, and the opportunity to compete at almost any age. Unfortunately, the vast majority of kids drop out of organized athletics by the age of 13. One of the main reasons is that playing time becomes severely limited for all but the most talented athletes. In bike racing, everyone gets to play and no one ever sits on the sidelines. Bike racing also provides a great opportunity for kids who are not drawn to or who don’t excel in traditional team sports. Many of these kids are outstanding athletes who simply haven’t found an outlet for their talents. It’s also one of the few sports where physical size is not a major advantage. Riders who are small in stature often produce surprising results against kids who are older or larger. We offer two programs for competitive riders, broken down by age, experience and commitment level. If your child loves to ride but isn’t interested in racing, our Adventure Club provides all the fun without the pressure of competition. The JV Competition Team is open to intermediate and advanced level riders aged 9 and up. 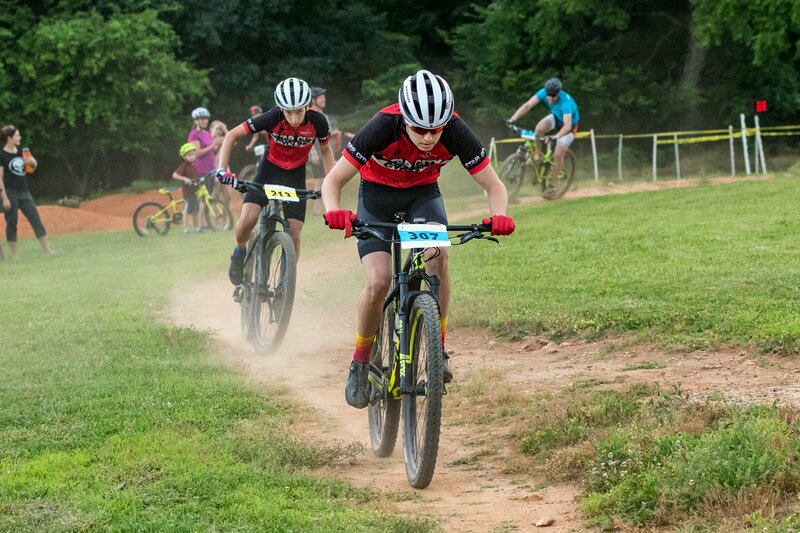 Members will compete in the Virginia High School Mountain Bike Series in the Spring, and the NICA series in the Fall, plus local races including the Wednesday Night Disco series and the SeptemberCross Series. Each member of the team will receive guidance on other events that are most appropriate for their age and skill level. Weekly practice rides will include an emphasis on skill building and endurance, along with race specific instruction and training. Members will be expected to attend at least 75% of regular weekly practice sessions, and will be encouraged to attend supplemental practices during the VAHS and NICA seasons. Those who are unable to commit to the full March-October season have the option of joining for the Spring or Fall sessions only. The Varsity Competition Team is open to advanced level riders ages 12 and up who have demonstrated a commitment to training and race preparation above and beyond the normal weekly practice schedule. Varsity Competition team members will participate in the same racing schedule as the JV team, and are encouraged to race in other optional events throughout the season. Weekly practice sessions for the Varsity team will be focused heavily on fitness and race specific skills. Members will be expected to attend at least 75% of scheduled practices. Those who are unable to commit to the full March-October season have the option of joining for the Spring or Fall sessions only.